It is not unusual for dogs to have stomach upsets from time to time. There are many possible reasons why our dogs can upset their stomach. The most common reason is eating something that they shouldn’t have. Upset stomach can also occur because of stress, eating too fast, a change in the dog’s diet, the presence of leaky gut syndrome, and pancreatitis. Regardless of the cause, however, you should know what to do to help your dog with its tummy upset. Here are some tips for you. Recognizing the symptoms of stomach upset in dogs is the crucial first step in its treatment. This is to help determine whether your dog needs professional veterinary help or not. There are different signs that can tell you there’s battle raging on inside your dog’s tummy. These can be benign manifestations and should not worry that much. Do understand that these manifestations can worsen over time. If you see any of the following manifestations from your pet, don’t hesitate to seek assistance from your vet. Vomiting and diarrhea are two of the most important manifestations of upset stomach in dogs. These conditions draw out water and electrolytes from the dog’s body. If the diarrhea and vomiting are severe enough, it can lead to dehydration. It is for this reason that you need to assess your dog’s hydration status. There are two things you can do. First, check your dog’s skin elasticity. Pinch the skin of your dog in the area between its shoulder blades. Release it immediately and check if the skin returns to its normal position in an instant. If it returns in an instant, then there’s no problem. If it takes a while before it returns to its normal state, then you can say that your dog has dehydration. Second, check your dog’s gums. On a healthy dog, the gums should be moist and pinkish in color. Try running a finger on your dog’s gums. If it feels moist, then there’s no problem. If it’s dry, then your dog may already have dehydration. Third, you can also check the capillary refill time of your dog. The capillaries contain blood. If there is dehydration, there is also a reduction in blood volume. If you press the dog’s gums, the area that you press will change in color from pink to pale pink or off white. This is because you are compressing the capillaries underneath the gums. When you release the pressure, the capillaries will re-fill with blood. Watch the length of time it needs for the gums to return to normal color after removing the pressure. Your cut-off is 2 seconds. If it takes longer than 2 seconds before the pressed area returns to its normal color, then you have dehydration. Many pet parents do not like fasting their dogs. This is quite understandable. No one wants to starve their dogs on purpose. But this is something that you need to do if your dog has upset stomach. Withholding its food for several hours will not starve your pet to death. Fasting is mandatory in dogs with upset stomach. The fasting period can last anywhere between 12 and 24 hours. This should be enough time to allow the gut to rest and facilitate its recovery. If you have a puppy or a small breed of dog, the fasting period should not last more than 12 hours. Overnight fasting is often enough. Dealing with a fasting puppy or a small dog can be challenging, however. They have faster metabolic rates than larger breeds. This means they will need to eat to maintain their energy levels. Applying a drop or two of pancake syrup on the puppy’s gums should do the trick. This can also help prevent the abrupt drop in its glucose levels. This can be tricky since drinking water can further aggravate the vomiting. This is often the case in dogs that drink large volumes of water at a time. One way you can go about this concern is by giving your dog ice chips or ice cubes. Your dog can lick the ice cube and stay hydrated without triggering vomiting. You can also fill your ice cube mold with Gatorade or any other drink that contains electrolytes. The combination of fluids and electrolytes will help negate the fluid and electrolyte losses in vomiting. Pedialyte is a better solution for canine dehydration, however. If your dog doesn’t vomit in the next 4 hours or so, you can give it small amounts of fresh, clean water to drink. If your pet is able to hold the water in its tummy for at least 2 hours, then you can introduce clear liquids. You can make an apple juice by mixing equal parts of apple juice and water. You can also make a 50-50 mixture of water and unseasoned chicken or beef broth. 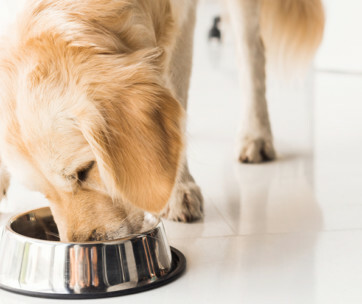 After fasting your dog, you can already start it on a bland diet. This is equivalent to the bananas, rice, applesauce, and toast (BRAT) diet in humans. One very important consideration here is that there should be no episode of vomiting during the fasting period. Your dog should also be able to hold small quantities of liquids in its tummy. If you can ascertain these two things, then you can start with the bland diet. Making a bland diet for your dog with upset stomach is easy. You only need 3 parts of boiled white rice and 1 part of low-fat protein. The protein can be either chicken or beef. Make sure to remove the skin from the chicken and trim the fat from the beef. You should also not add any seasoning, oils, or spices. You can use extra-lean hamburger if you like. In such cases, it is imperative that you drain the fat from the hamburger after grilling. Added fats can aggravate the stomach upset and can also cause pancreatitis. Remember to use only the leanest hamburger you can find. If there’s none, stick with chicken. Give this bland diet to your dog in 3 to 4 equal servings. Serve this bland diet for 3 to 4 days or until you can see improvement in your dog. There is a chance that your dog may not be ready yet with the bland diet. As such, it is best to give it a tablespoon of the bland diet during your first try. If it doesn’t vomit this within 2 hours, then you can increase the serving portion to 3 to 5 tablespoons. Do this in a gradual manner to let its tummy acclimatize to the presence of food. If your dog doesn’t like the taste of its bland diet, you can give it banana baby food. You can also give meat-based baby food preparations. Make sure there is no garlic or onion, though. You can also add cottage cheese or plain yogurt. The addition of probiotics in the bland diet can also help. It is also possible to add plain canned pumpkin. These ingredients not only help improve the taste of the bland diet. They can also help in reducing inflammation and firming up the stools. 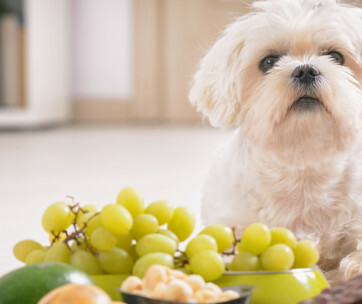 Once your dog is feeling better, you can start re-introducing it to its regular food. Slow and gradual reintroduction of regular food is necessary to help prevent upsetting the stomach again. To do this you will need to start with 3 parts of the bland diet and 1 part of your dog’s regular food. Give this to your dog for 3 days. If there are no untoward incidents, you can give equal parts bland diet and regular dog food. Again, give this for another 3 days. 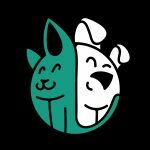 If your dog seems okay after the 50-50 mixture, then you can give it its regular dog food on the 7th day. You can also try giving your pet the best dog food for sensitive stomachs. These come with special formulations that will not upset your dog’s tummy. Like the bland diet, however, you should ease your dog into eating this kind of dog food. Start with smaller amounts. If your dog can take it without vomiting, then you can increase the serving sizes on a gradual manner. Managing your dog’s upset stomach at home is easy if the manifestations are mild. If severe vomiting and diarrhea occurs, do not attempt any of these tips. Bring your dog to the vet immediately.